Some panoramics on this page need to be reimaged. 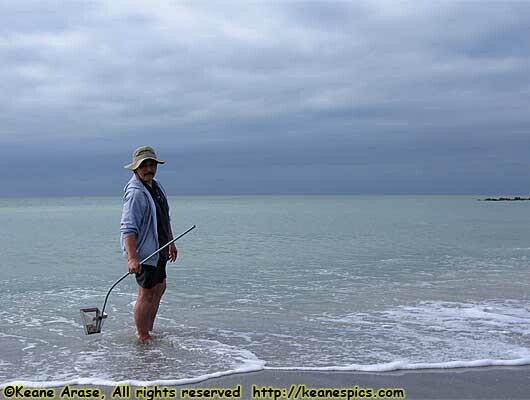 My 2009 Florida Vacation. 3 (12) days, 2789.3 miles. Well, I was in Central Florida. Of course the trip would involve going to Disney World, as most of my Southern or Southeastern vacations do, but you can read all about that (and more on Venice with a slightly different perspective) in my December 2009 Florida Trip Report. I was afraid Venice was one of those insane tourist towns, but (at least when I was there) parking was never a problem, and I found it a comfortable place to visit. We lodged in Venice at Inn at the Beach, a two story hotel right on the Gulf. We found the hotel via TripAdvisor. Jo called rather than using the online booking options, and found there are rooms they have that aren't listed on-line. These rooms face the Gulf, and the first floor rooms are called "Beach View" rooms, and the second floor rooms are the "Gulf View" rooms. We had one of the "Gulf View" rooms, and one of two rooms on property that had a private balcony that faced the Gulf. The room itself was pretty tiny, but had every amenity that you'd want, from a fridge/microwave/coffee maker, to a HDTV. The extra space on the balcony helps. There are two closets to put bulky things like suitcases. The small desk next to the TV is a perfect place for your laptop. I got a very strong wireless signal, and internet connectivity was without complaint. The premises is exceptionally clean and well maintained and the staff friendly. Perks like the availability of coffee in the lobby, a decent selection of items for breakfast, free shark tooth basket loners, even free bottled water. Venice beach is a walk across the street, and through the public Venice Beach parking lot. It's a very nice place. I wouldn't hesitate staying here again. Venice, Florida is about 20 miles South of Sarasota, and about 135 miles from Disney World. Much of the city is literally an island, separated from the mainland by an intercoastal waterway. Venice is known as the "Shark Tooth Capitol of the World", where you can just go to the beach, drag the sand a bit, and come up with fossilized sharks teeth. These can be brown to black, depending on where it's spent its life for the last thousand years. However, talking with the locals, Venice Beach is a bad place to look, since the beach is replenished with sand, and buries the teeth. We were told Capersen Beach is the place to go. Because of its location between the intercoastal waterway and the Gulf, it's a natural, undeveloped beach. 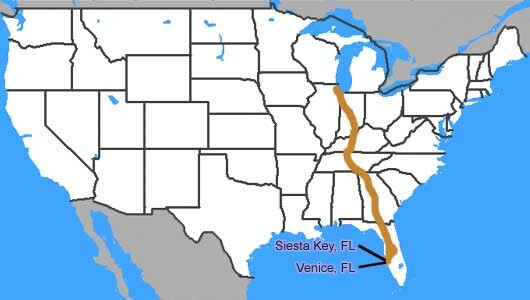 One of the early choices when planning the vacation, was to stay at Siesta Key. Of course we finally decided on Venice, and I'm really, really glad we did. After visiting Casey's Pass, we decided to take a drive up there and see if we made the right choice. Siesta Key is one of those little strips of land one the Gulf, that's insanely over-developed. Because it really is a strip of land, there's one road that goes down the middle of it, and it's lined by hotels and condos on both sides. Not a place I'd find fun, but the Beach was okay, and that might be the whole point of this place.